Though credit card and electronic payment methods have seen a surge in recent years, cash is still the proverbial king of the mountain, accounting for 33 percent of all transactions according to a 2015 report from the Cash Product Office. With trillions of dollars of cash in circulation, and due to the constantly evolving—and often volatile—economic landscape, cash management has risen as a top priority for maintaining the health of commercial businesses and financial institutions of all sizes. Business owners have more options than ever when it comes to selecting a cash management provider. But with 82 percent of small and medium-size businesses failing due to poor cash management, choosing a solution that can handle—and optimize—all aspects of a business’ cash flow is vital. Effective cash management solutions don’t just benefit commercial business—there are also advantages for Treasury Management, which plays a vital role in advising and aiding commercial clients on how best to manage their payments. Cash management today is about more than the physical safe and armored trucks. And businesses certainly expect more for their investment. Effective cash management uses a combination of customizable solutions that streamline and automate processes to cut costs, mitigate risks, improve operational efficiency, and increase profitability. Traditional cash handling, with all its numerous touch points, isn’t efficient, requiring employee training and time-consuming processes. With proper cash management solutions in place, employee labor can be reallocated to different areas of need, increasing operational efficiency and reducing labor costs. Additionally, outdated methods put businesses at risk of loss or theft, both internal and external, as well as endangering employees and customers. Cash management reduces those risks by minimizing manual processes, eliminating employee trips to the bank, and ensuring less cash on-site. Cash management solutions also give businesses more transparency. Faster access to cash and more accurate information, such as reporting and cash-handling data, is often available within moments of deposit. Finally, businesses should be able to count on their cash management provider as a partner and consultant that provides expertise and support beyond the typical service offerings, from system recommendations to customer support to remote system diagnostics. Treasury Management entities can experience both direct and indirect benefits from a commercial client’s association with a cash management provider. To help clients navigate the diverse cash management options available, Treasury Management professionals need to be educated and well-informed of provider offerings. In this way, a financial institution’s Treasury Management team can differentiate itself by taking on more of a consultant role with commercial clients, providing better insight on what to do with payments. Promoting cash management solutions allows Treasury Management to diversify offerings and to start a new conversation with clients, one that steps outside the boundaries of traditional banking. Endorsing the right cash management solution can help Treasury Management to build and foster long-term relationships, scale clients’ businesses, and grow the institution’s commercial business portfolio. This association could also potentially lead to further cooperation with the cash management provider. Streamlining cash-handling processes creates several other tangible benefits for Treasury Management. Cash management reduces the amount of walk-in traffic (and potentially large amounts of cash) that enters a financial institution, mitigating the risk of loss or theft. There are also operational benefits. For example, if the financial institution is in the midst of changing its business model (e.g., downsizing, thinning density in certain markets, etc. ), less commercial walk-in traffic allows the institution to divert labor and resources and run more efficiently. Moreover, because of increased smart safe deposits, which are guaranteed and provisionally credited to the client’s account, the institution can maximize the returns of reserves on hand, using funds to produce more loans and investments—and increase profitability. Every business’ needs are unique. When it comes to cash management, there is no one-size-fits-all system. 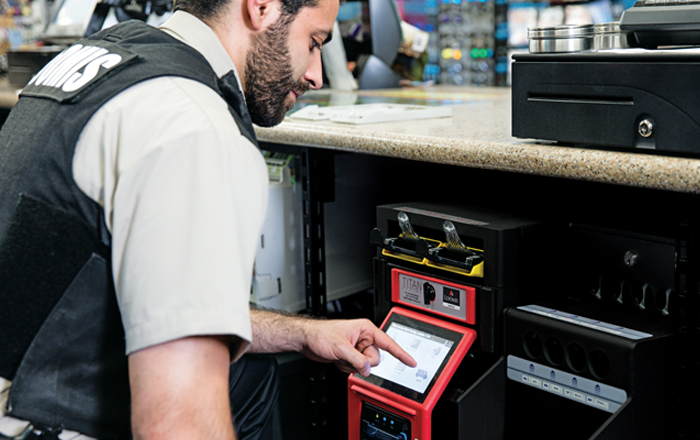 It’s important for businesses to partner with a cash management provider that offers flexible, customizable solutions and reliable service and support that equips them for the needs of today’s economy, while also preparing them for what’s next. For Treasury Management, it’s crucial to stay informed of the available options in order to better serve clients, build up relationships, and create new opportunities.